Gabriela Polinski’s father died a hard, and painful death, the result of his years in the West Virginia coal mines. When he passed, she left Wooten’s Hollow as soon as she could. Wade Gentry was a hardnosed trail boss from Comanche Wells, Texas. Jonas Parsons hired him to drive his herd from Texas to Montana. He offered him the job as Thunder Canyon Ranch foreman. An offer Wade couldn’t refuse. Can Gabby find happiness and romance as a mail order bride in the wilds of Montana? Can Wade, a quiet cowboy, always a loner, give up that life and find happiness with the lovely coal miner’s daughter? 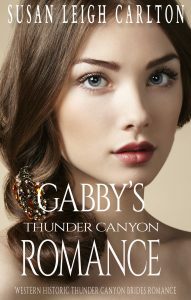 Purchase Gabby’s Thunder Canyon Romance here!